Your personal website is impressive, incorporating your blogging, tweets, an e-mail newsletter sign up and more. What do you see as the purpose or function of your website for you? It’s the place online that’s totally mine. I own it, I decide what happens there, and it collects everything I do in one central place. It has the most comprehensive information about who I am and what I do. No matter where else I am active online (social media, community sites, e-mail, etc. ), I always point back to my website so people can find out more and stay in touch by whatever means they prefer. All serious writers need this kind of hub so they can start learning more about their readers and formalizing a connection with them. Facebook, Twitter, and other sites help you find readers and connect, but those connections can disappear at any moment, or gradually over time. Having your own site gives you more control and insight into your connections, how people are finding you, and why people find you. Did you launch your current site through your own devices, hire a professional, or through some other means? I did everything myself. I bought my own domain (JaneFriedman.com) and hosting through GoDaddy. I installed WordPress on my site, then bought a premium WordPress theme that looks great without any customization. I’ve used WordPress for many years, so it wasn’t difficult to get started with it. I prefer WordPress because it’s free (open source), continually improved and updated, and has amazing support and features because of the huge community that’s developed around it. I also love WordPress because it’s a content management system (as opposed to site design software), so it’s easy to add loads of content and media without having to know any coding. Just about anyone with a computer and Internet access can do what I did in one (long) evening after watching a few simple online tutorials. I have thought about hiring a web design professional to kick my site design up a notch—to add some personal style—but I’m more concerned with function and substance right now. If you could only pass on one piece of advice to writers who are seeking to “make a career” out of writing, what would it be? Think beyond the printed page; think beyond the book. There are so many wonderful, unique ways to deliver a story or spread a message, but we often limit ourselves to thinking of the way it’s always been done. It’s more possible (and more fun) than ever to make an impact outside of the traditional publishing options. So, think more deeply about who your audience is and how you are most likely to reach them. Think about blog posts, e-newsletters, podcasts, videos, and Twitter accounts. Think about online community sites. Think about personalized experiences. Not every piece of material or content really deserves or needs to appear in print or in a traditionally edited publication. That’s not what grants authority any longer. Instead, it’s about how you can beautifully match your content or story to the right medium so that it perfectly serves the needs of your audience. 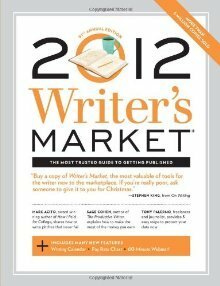 Many thanks to Writer’s Market editor Robert Brewer for the excellent interview! Posted in Digital Media, Social Media, Writing Advice. Good post. I like blogging – it’s a break from the intensity of writing. Besides, I can say what I want, even if I do suffer from foot in mouth disease. LOL! Thanks for taking time to comment. I love the think outside the book approach. As usual, yet another f’in gem, Jane. You’ve convinced me that I actually do need a blog! This might sound silly but when should you start blogging? Before or after you’re published? The sooner you can start, generally the better, especially for nonfiction. It takes a while to build an audience and develop your voice & rhythm. I agree! Writers do need their own website. Blogging, even though you need to wait for your efforts to pay off, it lets you de-stress as you write about the things you want and are interested in.